News, notes and maybe a little snark from the world of Breyer model horses. Greetings, readers! Welcome to the latest edition of Featured Model, the weekly blog event where I pick a model from my collection, give some stats on it and provide commentary about it. This week's model is the model, the myth, the legend...Alborozo! 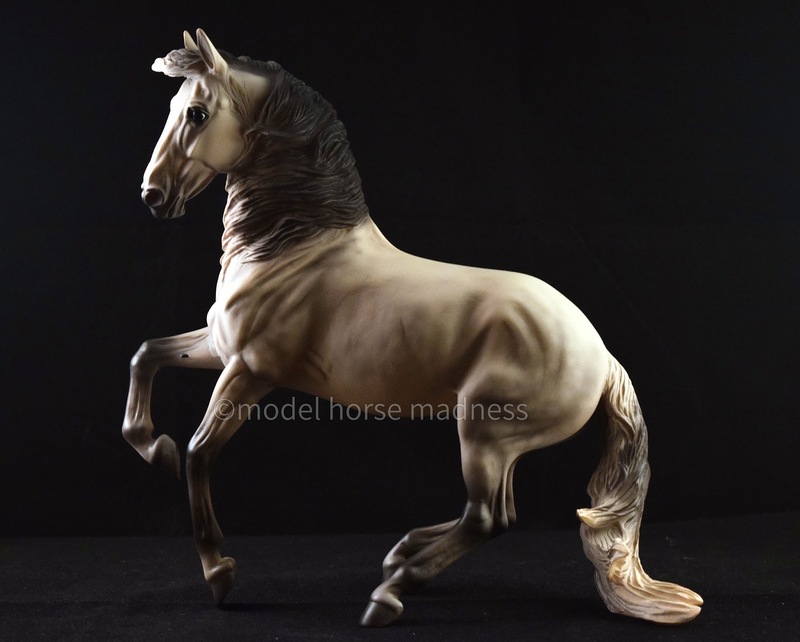 Alborozo was, of course, the Breyerfest Celebration Model from 2008, and is most famous (or infamous) for his mold being destroyed after that appearance. He's item #711108, and was one of the first models Brigitte Eberl sculpted for Breyer. Approximately 6,000 Alborozo models were produced before the mold was destroyed. Questions still swirl around Alborozo's unfortunate-but-planned demise. Why did they do it? Some sources say it was because of an agreement between Breyer and the real horse's owner. Others say it was a gesture of good faith from Breyer toward Brigitte Eberl, because she had been burned by Stone in the past. Still others say it was just a publicity stunt. Word from Breyer itself seems to have been scarce, and I wasn't participating in the hobby at the time, so I can't provide any word-of-mouth knowledge of my own. The page on the mold's destruction from the Sept/Oct 2008 issue of JAH says only that, "Because BreyerFest is an event we work all year long to share with you, and because it is the greatest expression of our brand ... we really wanted to do something exciting and collectible - something we've never done before!" So that wording tends to support the publicity stunt angle. I tend to think the reasoning may be a combination of all three of those possibilities, and maybe others as well. It probably seemed like a good way to drum up interest in Breyerfest at the time, though it is a disappointment that the mold they chose to destroy for Breyerfest was such a nice one. Unfortunately, we'll never get a regular run Alborozo, or a web special, or anything else other than a few auction models, perhaps another early bird special, or maybe a raffle model. Breyer did say they'd held back a few blanks to use as auction pieces (and the 2014 Early Bird Alegria), though we've only seen one since 2008 (in 2012). Maybe this year we'll get another auction Alborozo! It won't be long now until we find out. As for me, I'm happy to have my Alborozo - he's an important piece of hobby history, and perhaps a good example of what not to do to sell Breyerfest tickets. It's unlikely I'll ever be able to get my hands on a glossy Alborozo or Alegria, so I'll cherish this guy forever. Live Auction Lot 14 - AHHHHHHHHHH! Live Auction Lot 13 - Carrick! Kid's 4th of July Grab Bags Available! Live Auction Lot 10: Lots of Spots! Live Auction Lot 9 - Scratch Art! Vintage Club Ali is now available! Live Auction Lot 7 and Glossy Prizes! Wolfgang and True North are here! Live Auction Lot 5: Whoa! Live Auction Lot 4 - Totilas! Live Auction Model #3 - Adios! Breyerfest Auction Lot 2 - It's the Show Jumper! The 2017 Breyerfest Auction Countdown Has Begun! The Breyerfest 2017 App is now available! Spirit Blind Bag Stablemates have arrived! Mid-Year Releases have been revealed! Wolfgang, Third 2017 Stablemate Club release!